North Carolina solar companies Archives - Solar Love! Home Tags Posts tagged with "North Carolina solar companies"
With declining prices and so many leading North Carolina solar companies to choose from, it’s easier and cheaper than ever to harvest clean, free solar energy to power your home or business. 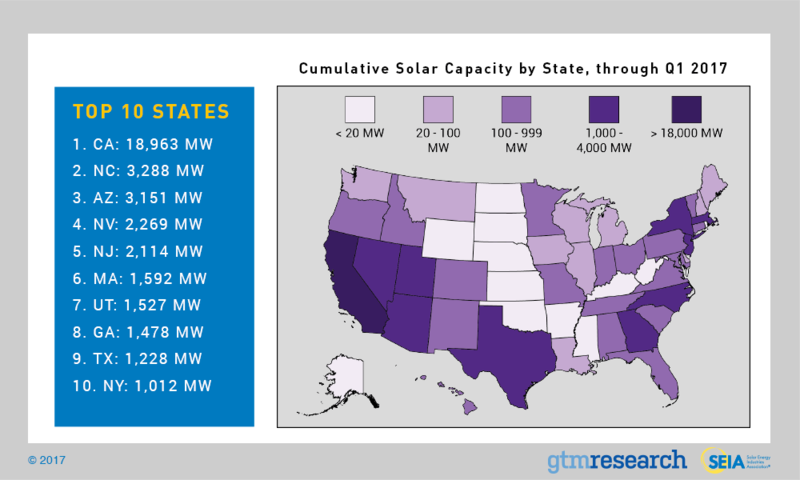 Currently ranking number 2 in solar capacity across the United States, North Carolina provides solid proof that you don’t have to live in a desert to get great advantage from the sunshine hitting your state. And, with recent positive legislative changes regarding solar energy, plenty more solar rooftops will soon be sprouting in the Tar Heel State. That’s great news for North Carolina solar companies, and even better news for you, if you’re among the fine group of folks still dreaming of making hay–or at any rate, clean free electricity from a new rooftop solar installation–while the sun is shining in North Carolina. Solar power provided 39% of all new electricity generating capacity in 2016. This set the US record, topping all other power generating technologies for the first time ever. In 2017 so far, solar power is continuing this trend with 30% of all new capacity coming from solar energy in the first quarter of 2017. The Solar Energy Industries Association (SEIA) reports that there are now around 1.4 million solar installations across the US, or nearly 45 GW of total solar capacity installed. This represents enough power being generated from the sun to plug in more than 8.7 million homes. By 2018, SEIA predicts, this number will reach 2 million and will double by 2022, reaching 4 million brilliant solar powered homes and businesses. SEIA also reports that the price of rooftop solar installations in the US has dropped over 70% since 2010, due to strong competition and increasing economies of scale. And, thanks in good measure to the positive effect of the 2006 Solar Investment Tax Credit (ITC), the annual growth rate of solar in the country has been a whopping 68%. And, as North Carolina solar companies can easily attest, more than double the number of Americans are now employed in solar jobs compared to just 5 years ago. In fact, there are now over 260,000 folks in the US earning their pay by supporting the harvest of free, clean energy from the sun’s golden rays. Well, not just in North Carolina, but in states all across the nation, solar companies are helping business save money. SEIA’s latest annual Solar Means Business report shows that businesses are going solar at something like the speed of light. Dropping by 16% in the last year and 58% in the past 5, falling prices for commercial solar installations are encouraging more businesses to save money by installing solar power systems. SEIA’s latest report notes that over 1,100 MW of capacity has been installed at over 2,000 different locations by the top 25 corporate solar users in America as of October 2016. Not just a cost effective business decision, businesses going solar are making a significant contribution towards climate change mitigation. The amount of solar capacity currently installed at US businesses and corporations alone is able to offset more than 1 million metric tons of carbon dioxide (CO2) emissions every year. 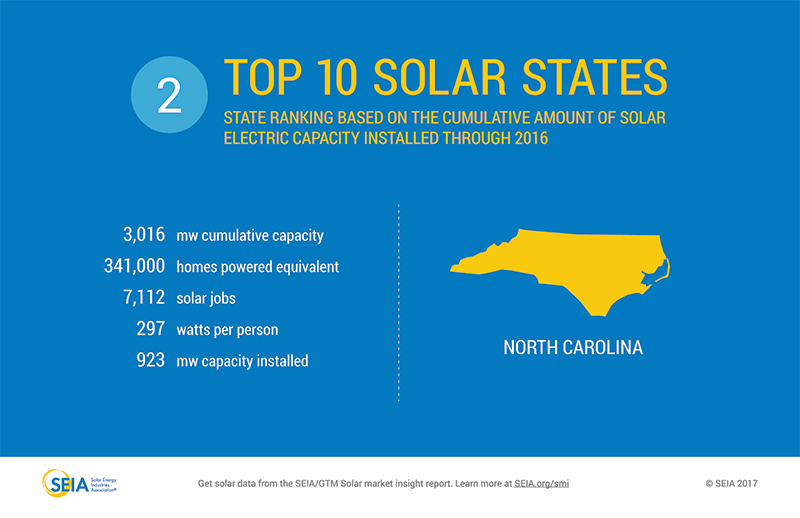 What makes North Carolina so special that it is the Number 2 Solar State in the US? Similar to most states across the southeast US, North Carolina sees sunshine for about 70% of daylight hours from spring through autumn, and about 50% of daylight hours during winter when days are shorter and cloudiness is more prevalent. However, SEIA attributes North Carolina’s successful solar growth rate in part to the state’s Renewable Energy and Energy Efficiency Portfolio Standard (REPS) which allows clean energy companies to compete with utilities and thus gives consumers more choices in their energy supply. According to the most recent data, over 994 MW of solar was added to North Carolina’s solar capacity in 2016, bringing the total solar capacity installed to 3,287.5 MW and elevating the state from 4th in the nation to the number 2 state for solar capacity installed. As prices have declined by 64% over the last 5 years, North Carolina has seen over 371,000 homes switch to solar power. And, over the next 5 years, SEIA predicts the state will increase solar capacity to more than 3,650 MW. Solar energy has been very good for North Carolina’s economy, too. Over $1,174 million was invested in solar during 2016, bring the total solar investment to more than $5,236 million. 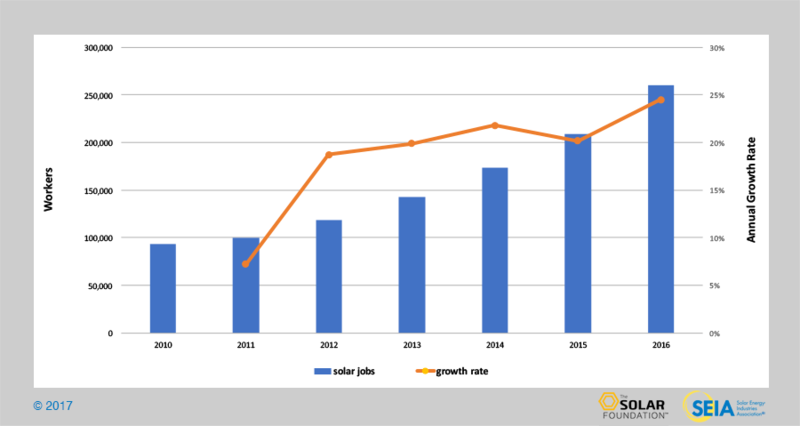 These investments have encouraged strong growth in the solar jobs market, with SEIA reporting 7,112 people currently employed in the solar industry, spread across 248 North Carolina solar companies. This total breaks down into 43 solar manufacturers, 108 solar installers/project developers, and 90 other solar-related businesses, including project consultants, architectural/engineering services, financial service providers, solar service providers, equipment distributors, not-for-profit solar promoters, etc. For the most notable solar installations in North Carolina, Duke Energy takes the cake with about 450 MW of solar capacity installed statewide. This is enough electricity produced from the sun to power about 85,000 homes. Completed in 2015, Conetoe II Solar LLC in (imagine that) Conetoe, NC, is providing 80 MW of solar capacity, or enough solar power to plug in more than 9,030 homes. Also among the larger solar installations in the state is Carol Jean Solar in Walnut Grove with 4 MW of capacity, enough to power more than 451 homes. 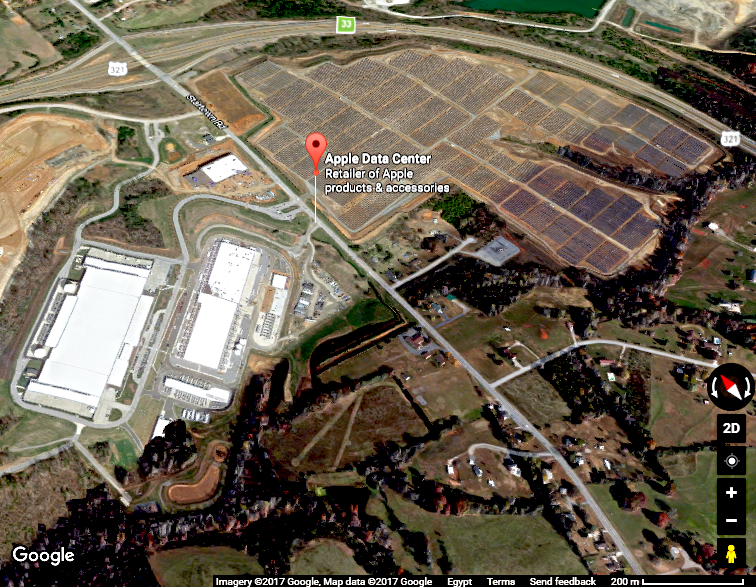 Apple Data Center and Solar Farm, Maiden, NC. Screenshot from Google Maps. Although much better than other southern states, North Carolina’s solar policies and incentives are rather lackluster, to say the least. There’s a Renewable Portfolio Standard (RPS) calling for 12.5% of investor-owned utilities’ electricity coming from renewable sources by 2021, and a solar carve out of 0.2% (matching the 0.2% carve out for fuel from North Carolina pig dooky). Beyond the federal ITC, a short-changing net metering policy, and a property tax exemption, though, there’s not much more for new solar customers to get overly excited about. This is certainly not the fault of North Carolina solar companies, but it does stiffen the competition. With an average utility rate of $0.1178, a little lower than the US average of $0.1245, new solar customers in North Carolina are in need of the best bang for the buck. This means carefully evaluating the leading contractors before choosing the right one for the job. If y’all are among that fine group of folks thinking about getting a solar quote for a new installation, the following tips will be handy to keep in mind when evaluating the leading North Carolina solar companies. Will you be adding a pool, hot tub, or solar water heater? How about a new EV and/or an EV charger? Are you on a tight timeframe for your solar installation? Be sure to discuss this with potential solar contractors. Are you on a tight budget? 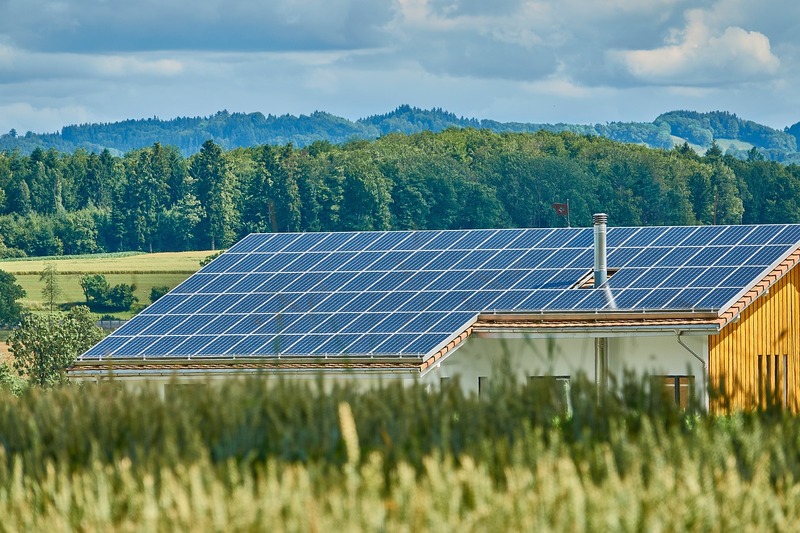 All the leading North Carolina solar companies must be able to help you explore the options for owning your own system and the new leasing options recently made available. Are you familiar with all of your local, state, and federal incentives, as well as local permitting and other utility-related rules and regulations? Make sure that the solar company you choose is fully experienced and can explain all of this to you in straightforward terms. Keep in mind that labor and ‘soft’ costs represent about 50% of the price tag for a solar installation. Customers often foot the bill for advertising campaigns and marketing costs, so larger solar companies with larger advertising campaigns may have higher price tags. Also, higher quality hardware, while more costly, will likely bring a better harvest of solar power so a higher price tag due to better hardware may be worth considering. Don’t let the lowest quote be the sole factor in your final decision. Also, ongoing support, maintenance, and honoring warranty details are very important, both in the short term and in the future, so choose carefully between local and out-of-town solar companies. You need to be assured of prompt service for the lifetime of your solar installation. Like every reason for going solar, every solar installation is unique. And every solar installation comes with high rewards, not just in savings on your utility bills. By harvesting solar energy instead of burning fossil fuels, you are doing your part to protect the environment and helping to mitigate the negative impacts of climate change. You are actively taking part in the renewable energy revolution by powering your home or business with clean, free solar energy. Now that’s what I call making hay while the sun is shining! 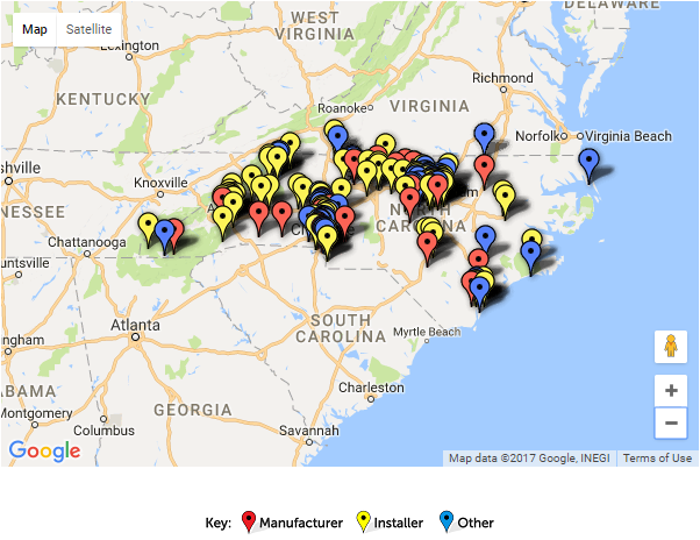 Providing you with a list of the leading North Carolina solar companies for 2017, this handpicked list includes current contractors in the residential, commercial, and utility solar market. Because every solar installation is unique, this list is alphabetical, not ordered by ranking factors which may or may not apply to your case. Curated from reviews and rankings from such sites as solarreviews.com and solarpowerworldonline.com, the following list represents the leading North Carolina solar companies in the market.